Date a boy who sings. The kind who’ll hum softly to himself while driving, doing the dishes, brushing his teeth, or solving a math paper. The kind who’ll break into a song because he just can’t help it. Out of the blue, like first rains, like stray sunbeams in winter. Take a minute to realise how happy it makes you. To realise that most of us break into songs only when we’re happy. How having him around just makes things a little breezier. Date a boy who sings because he will listen. He will sense the change in your tone and the distance your voice. He will know when you don’t want to talk. And that some things are best left unsaid, unwritten, unarticulated. Like the understated sorrow in the tune of a violin, like the bold, unconquerable spirit of a bongo. He will understand the nuances of your sighs, laments and laughter. He will make it impossible for you to fool him. Date a boy who sings because he has a deep love for romance. He’s heard too many love songs to not believe in true love. The kind who wears his heart on his sleeve. Naïve, charming and charismatic in a way he’ll never know. The kind who will fall hopelessly, irrecoverably in love with you. And never be bored. The kind who savours late night conversations like his most played song set on loop. Date a boy who sings because he can handle a heartbreak. He knows he’s not alone. He will find solace in knowing that so many have felt exactly how he feels. A way to articulate his thoughts when he’s got nothing left to say. Date a boy who sings and realise how lucky you are. Watch girls swoon over his voice the way girls do when boys sing. Feel that bitter-sweet sense of possessiveness and pride take over you. Feel like at some strange level, his voice is more yours than anyone else’s. Date a boy who sings. Be his muse. Be the girl he sings about. More importantly, be the girl he sings for. The girl who gave those love songs deeper meaning. The one who put a face to all those songs he’s sung over the years. The one who gets to fall asleep to a lullaby and wake up to soft, absent-minded humming. Realise you’re always connected. When you stop to hum along to the song he’s singing in the other room. When he tells you the song that played on the radio on his way to work reminded him of you. Date a boy who sings because he will never forget you. Years down the line, he will remember you like he remembers the lyrics of the Disney songs he would sing as a kindergartener. Like the breezy burst of nostalgia he feels when he thinks of his favourite song in 7th grade. Date a boy who sings to know the kind of love that makes you break into sappy love songs, snap your fingers and tap your feet. The kind that has you swaying to a tune in your head that you don’t even recognise. The kind you thought you were never foolish enough to believe in. 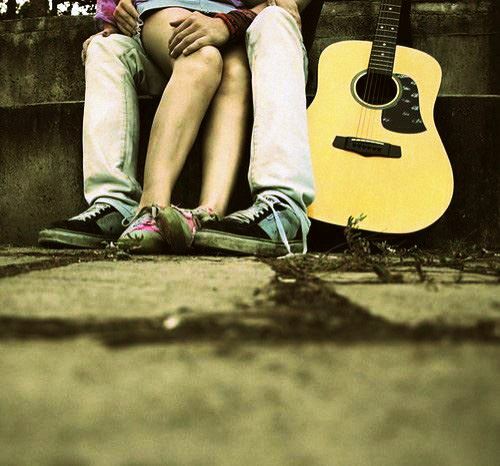 Date a boy who sings, if you’re looking for love. Or anything like it. Reblogged this on Infinite Dreams. Haha…a sarcastic reply would be to quote Roxana Shirazi..she fell for a guitar player because fingers that handle an instrument so well would give her more pleasure than imaginable…but on a serious note very well written!! Hahah, cant blame her. Just another one of the many reasons to date a musician.